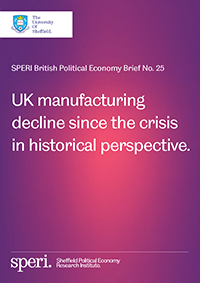 A new SPERI British Political Economy Brief ‘UK manufacturing decline since the crisis in historical perspective’, published today, argues that UK manufacturing has entered a new phase of decline. In the 5 years since 2011 the UK manufacturing sector has bucked historical trends and created new jobs. However, output growth since 2011 has been negligible. Traditionally, the sector has been able to increase output despite job losses due to productivity gains. While the decline of manufacturing appears superficially to have halted, this new analysis suggests the sector’s decline has in fact entered a new, dangerous phase. The report explores the challenge facing Theresa May, who has made industrial policy one of the key pillars of her economic agenda, and casts doubt on the recent positive commentary surrounding manufacturing in the context of the current post-Brexit collapse in the value of sterling. “The growth in manufacturing jobs in the last five years, however limited, is to be welcomed. British manufacturing is not dead, but the sector is in great peril. There are few signs of sustainable growth in advanced manufacturing industries, and we now seem to be witnessing a new phenomenon whereby the UK manufacturing sector is creating lower-skilled jobs without enhancing its productive capacity. This is a different kind of manufacturing decline than we have experienced in the past, but it is decline nevertheless. “Despite some analysts predicting a resurgence in manufacturing due to the fall in sterling, Brexit is likely to prove to be a significant challenge to the manufacturing sector in the years ahead, given the probability of trade barriers between the UK manufacturing and its key trading partners, lower levels of investment from European manufacturing firms, and a more challenging research environment for UK universities.